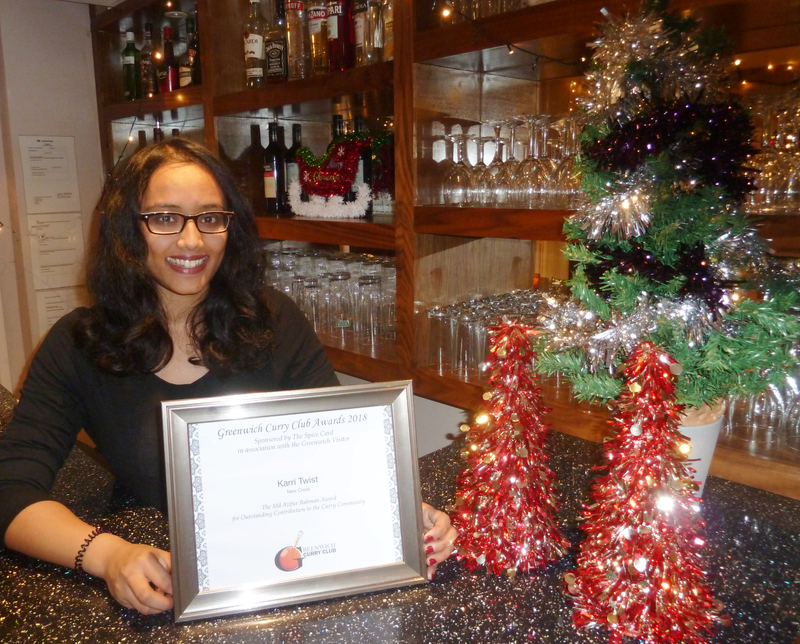 The inaugural Md Azifur Rahman Award for Outstanding Contribution to the Curry Community in the Greenwich Curry Club Awards 2018, sponsored by the Spice Card, goes to Karri Twist (New Cross). Pictured below: Tazkia Rahman, grandaughter of Md Afizur Rahman, who opened the restaurant in 1957. 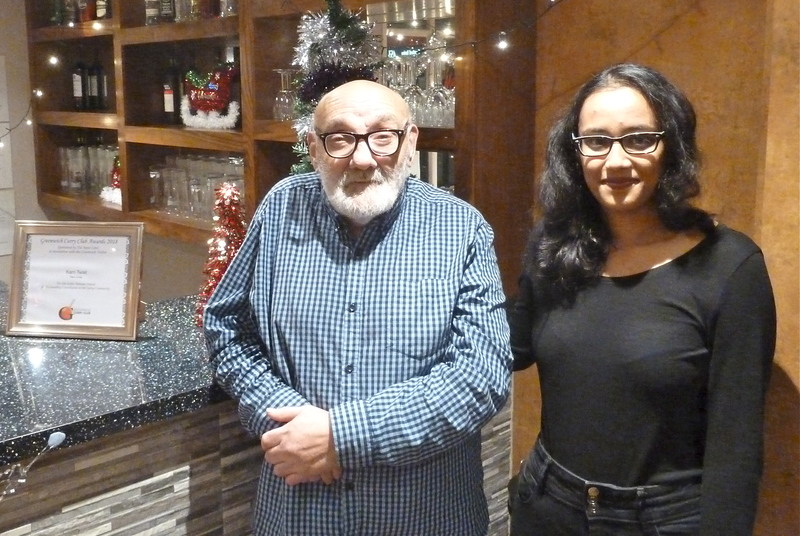 Pictured: Tazkia Rahman with customer Roger Hepworth, who has been eating in Karri Twist since the 1960s. The Special Award in 2018 in the Greenwich Curry Club Awards, sponsored by the Spice Card, goes to Panas Gurkha (Lewisham) for Outstanding Vegetarian and Vegan Food. Pictured: restaurant owner Mr Sujan. The restaurant offering Oustanding Value in 2018 in the Greenwich Curry Club Awards, sponsored by the Spice Card, is Pathiri (Greenwich). Pictured from left: Ameer Kutty (owner), Mustafa T (chef). The restaurant offering Outstanding Service in 2018 in the Greenwich Curry Club Awards, sponsored by the Spice Card, is Kesar (Charlton). Pictured from left: Somu, (restaurant boss), Harjeeth Singh (tandoor chef), Narayan (curry chef), Geetha (chef), Gabi (manager), Gurdeep Singh (owner), Akshay (waiter). The Favourite Newcomer for 2018 in the Greenwich Curry Club Awards, sponsored by the Spice Card, is the King of Punjab (Isle of Dogs). Pictured: Restaurant owner and head chef Tony Chahal. The Favourite Restaurant for 2018 in the Greenwich Curry Club Awards, sponsored by the Spice Card is Gurkha’s Inn (Greenwich). Pictured from left: restaurant owners Usha and Giri Devendra.